Hi, I'm Rebecca and I'm a shopaholic. Okay, not necessarily, but I'm getting dangerously close to that territory. Recently, I've been trying to shop less and save money in the times that I do shop. I've been trying to visit the shops more and online shop a less often. Obviously, it's a work in progress, but I've been slowly training myself to shop less. 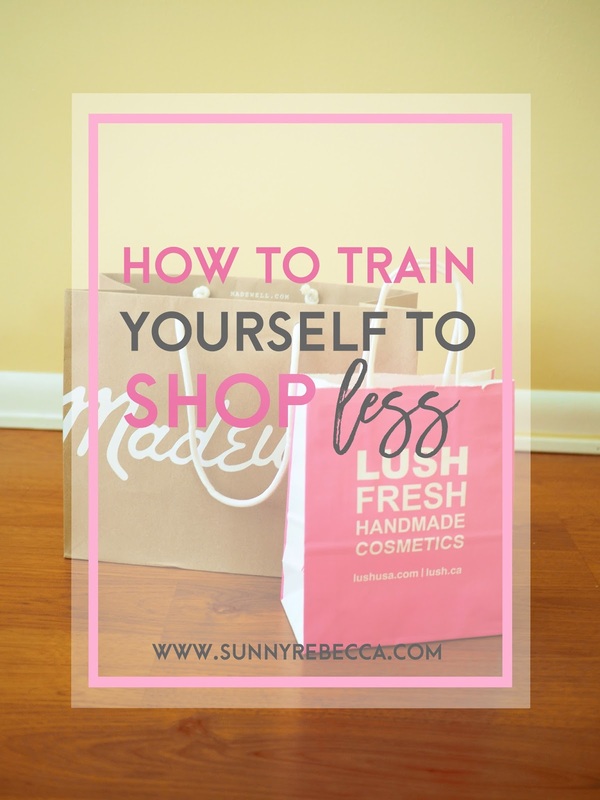 If you too are struggling with spending too much, money, here are some tips for how to slowly make your way to shopping less. I like to tell myself that the emails that I get from the stores are a helpful way to be updated on sales and such, and yes, that's true, but it can also cause you to start shopping more. The ads that they send out are meant to promote the stores, so the emails will make you more likely to shop. If you're looking to shop less then I would suggest unsubscribing from all the retail emails, since they not only clutter up your inbox, but also cause you to to shop more. I know that it's easy to think that you're missing out on great sales, and while that may be a little true, there will always be more sales. I am the queen of buying things that I absolutely do not need. Whether it's a fancy overpriced latte or a floral notebook, I always buy lots of little things that I like, but in reality, I don't actually need them. A great way to cut down on shopping is to ask yourself if you really need it and to be honest with your answer. 90% of the time, the answer is no. If there are those moments that you're not that sure if you really need it, then I advise to you to not buy it. Let's put this into a scenario. Scenario: You're at Sephora checking out the newest products when you discover the best scented french vanilla body wash. It's sweet smelling and your mind tells you that you NEED it. Downside, it's eighteen dollars. You say to yourself, it's soap, I definitely need soap, it's something that I'll use. While that is true, soap is definitely a necessity, do you really need an eighteen dollar bottle of soap? Whether it comes to clothes or cute stationery, where there's a more clear divide between what you need and what you don't, or it's something more household, like fancy soap, with a bit of a blurry line whether or not you need it, you need to consider if you can go without it. In that moment, it may feel like there's no way that you can live without that product, but in the long term, you're not going to remember about that eighteen dollar bottle of french vanilla body wash.
Don't buy things unless you're 100% head over heels in love with it. There have been so many times that I've bought things that I think that I like and then I end up never wearing them. One of my friends mentioned this to me before when I asked her whether or not I should buy a pair of shorts, especially since they were deeply discounted at $8. My mind told me, "SALE!" and encouraged me to purchase it. However, my friend said to me, "Don't buy things unless you're 100% head over heels in love with it." When things are on sale, especially if it's 50% off or more, it is so compelling to purchase things, just to take advantage of the great discount. While the discount may be great, it doesn't actually benefit you unless it is something that you would have bought anyways. If the price was $20 more expensive, would you still purchase it? It only makes sense to purchase things if you are absolutely in love with them, don't just buy things for the sake of purchasing new clothes or for the discount. Take a step away from Instagram. As a blogger, I am highly invested in fashion. My Instagram feed is always filled with bloggers wearing the most gorgeous clothing, but the downside is that the clothing is anything but cheap. While ads are not that effective in pulling you to the shops, Instagram is way more effective than you think. When people post pictures of their gorgeous dresses and their fancy shoes, I literally swoon at them and say to myself, "I HAVE TO HAVE THAT." I know that a people assume that if I comment something like "I love your dress!" or "Your shoes are so cute!" on a successful blogger's Instagram then it means that I'm trying to get people to click on my account, but I don't comment anything unless I do truly love that look. Power off Instagram for a bit, because it's not going to do anything but make you jealous and head out to go shopping. Cut down on one thing at a time. Don't expect to be able to stop shopping all together, but instead cut down on things once at a time. I tried to cut back spending on candles, since they're definitely things that I can live without, not to mention that they're overpriced. Start with something small and then move onto shopping less and less. It's just like quitting anything, you need to slowly work your way through. For me and my cut-back on candles, I haven't purchased a candle since last summer, but that doesn't mean that I haven't been using them anymore, I've just been using them less often so that I can make the use of them for a longer period of time. Bonus tip: Some great things to cut down on if you're just beginning to shop less would be accessories, such as jewelry and scarves. Move onto shoes next, since you can live on a small number of shoes. Don't go to the shops. The most obvious and most effective way to shop less is merely to not go shopping. Avoid going to the mall and stay home. Take advantage of the clothes that you already have and make the most of what you have. (Here's how to make the most of your wardrobe!) Experiment with some new clothing combinations that you have yet to explore. Stay away from online shopping and resist the urge to visit the stores. Shopping isn't necessarily a bad thing, so it's okay to indulge in it sometimes. I think that shopping should be done in moderation, so it's okay to buy some things every once in a while. However, if you're looking to save money while shopping, I did another previous post about shopping on a budget, so that when you do shop, you can save money while doing it. I definitely need to work on shopping less, especially since I'm about to start college but it's just so hard to do! I'll for sure start to exercise these tips!